Today, In This Tutorial I Am Going To Show You How To Create Wifi SSID Finder Using Python And Scapy Module. So, let's Start With Some Basic Knowledge About Packets.. But Today, We will Focus Our Target Only On Beacon Frames Because Every Available Access Point Continuously Transmit/Send Beacon Frames On Air To Introduce Their Access Point Network Availability. That's Why Today, We will Only Try to Find And Filter Beacon Frames Available In Our Range. 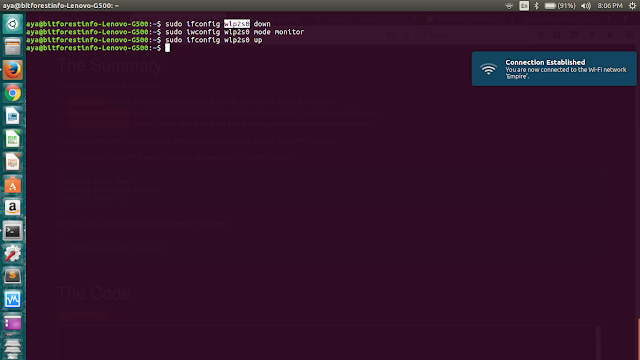 But For This Process, First We Need To Set Our Wireless Card In Monitor Mode. If You Don't Know How To Do It, Then Check Here Another Tutorial. Now, let me Explain You Exactly What We Are Going To Do With Our Python Codes. In Our Codes, First With The Help of Scapy Module, We Will try To Capture All Available Packets On Air Then Again With The Help Of Scapy Module We Will Also Extract And Decode Beacon Frames To Find Available Access Point. In Simple Words, We Will Try To Extract Beacon Frames Because As I Already Described Above These Frames are Responsible To Find New Available Access Point SSID And BSSID. here, SSID means AP Name And BSSID means Access Point MAC Address. Now, Let Me Show You Quickly My Codes. Point Information From Captured Packets. Now Let Me Break These Codes In Small Parts, For Better Explanation's. This Is Only A String Format To Print Packet Information On Terminal. Here, GetAPStation() Will Works As Main Function, In This Function, def PacketFilter(pkt) is Responsible For Extracting Useful Data From Captured Packets. In Simple Way, In This Functions, if pkt.haslayer(scapy.Dot11Elt) and pkt.type == 0 and pkt.subtype == 8. This If Statement will Verify The Availability Of Beacon Frame In Captured Packets And After Verification, Our Function Will Also Check About SSID In Our List To Prevent From print Same Data Again and Again. At the End, print statement is For printing Information in our Terminal. Simple! At Last Line Of This Function, scapy.sniff(prn=PacketFilter, *args, **kwargs) Statement Is Very Important And Main Statement For Sniffing Packets Because With The Help Of This Statement Available With Scapy Module, We Can Do Many Types Of Sniffing Very Easily. So, Here With The Help Of Sniff Function We Will Sniff All Packets From Specified Interface And One More Good Feature With This Function Is, This Statement Also Provides Function Calling Facility To Manage Packets. So, Here We Will Pass PacketFilter(pkt) function For Data Extraction. At The End, Create A Trigger Function To Call Our Main Function. As You Can See In Above Codes I Passed Two Arguments As Iface Is For Monitor Mode Interface And timeout is for timeout. And Then, Wait For Few Moment To Find Available Access Points In Range of Your device.